Yanni Carmela Javier is fascinated with wearing the immaculately white uniform of doctors, working in hospitals and helping the sick get well. That is why, even if her family can hardly make ends meet, Yanni pursued her dream and enrolled in BS Nursing at Pamantasan ng Lungsod ng Marikina (PLMar) as her pre-med course. 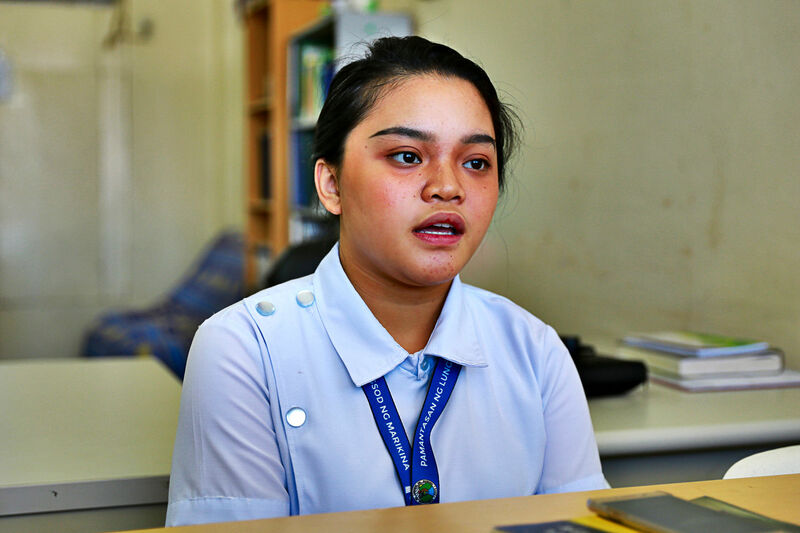 She hopes to pass the nursing board exams after college, get a job, save money and afterwards enroll in a medical school to get a degree in medicine. “I’ve always wanted to work in a hospital either as a doctor or a nurse. I imagine myself doing laboratory works, wearing white uniforms, doing the rounds,” Yanni says. The youngest among three children, all girls, Yanni says even if her two older sisters are now working after finishing their college education, money at home remains tight. Her siblings’ and her mother’s combined incomes are not enough to support her studies. Her mother, a bookkeeper, and her father, who tends a small variety store at home, had incurred debts sending them all to school. Until now, she says they are still paying for those debts. To support her studies, she wanted to work while in school, but her family objected to it since her nursing course is very demanding and time-consuming. Thus, Yanni is grateful that PLMar is offering free tuition, a dream project of Mayor Marcy Teodoro. “Because of the free tuition fee, I can now afford to buy books and other things I need for my nursing course,” says the 21-year old Yanni, who is in first year. Before enrolling in PLMar, Yanni was studying at the state-owned Polytechnic University of the Philippines, taking up BS Education. But since she wanted to be a doctor, she moved to St. Paul’s and enrolled in BS Biology. The stiff tuition at the private school forced her to transfer to PLMar. Thanks to the free tuition at PLMar, Yanni is now close to fulfilling her dream of becoming a doctor or a nurse or both some day.